As has been pointed out in recent years, while global warming has winners and losers, the associated accelerated sea-level rise only causes loss. Since a large proportion of the world population lives in the coastal zone and this number continues to grow, there is a strong interest in understanding the intricate relationships between climate change and sea-level change. We work on several aspects of this problem, and take advantage of the unique sedimentary archives along the US Gulf Coast. For example, the extremely low tidal range (mostly <40 cm) allows us to study the connection between subtle, dm-scale sea-level fluctuations and hemispheric temperature changes during the past two millennia. The PhD research of Juan González involved the collection of densely spaced basal-peat samples that are analyzed for specific, organic sea-level indicators datable by AMS 14C. We currently work with the AMS lab at the University of California, Irvine. We also study older records, and perhaps the most exciting finding so far is the discovery of the first sea-level record directly associated with the so-called 8.2 ka event, the most dramatic Holocene climate cooling that was the result of the catastrophic final drainage of proglacial Lake Agassiz. Former postdoc Frank Li has recently extended this line of work, which also includes climate-model experiments with the group of Hans Renssen at the Free University Amsterdam. In the post-Katrina era, few issues are more vital for the New Orleans metropolitan area and the adjacent Gulf Coast than an improved understanding of the factors controlling land subsidence. Sea level provides a unique framework to address this problem. 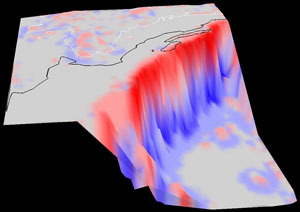 Given the fact that sea level is an equipotential surface, reconstructing past sea-level positions in different geographic areas gives us an opportunity to measure the amount of deformation of those originally near-horizontal surfaces. Such deformations, if present, allow us to calculate rates of long-term crustal movements that are likely to continue into the future. Using state-of-the-art radiometric and geodetic techniques (the latter with support from UNAVCO, Inc.), we can now do so with an accuracy and precision on the order of fractions of millimeters per year. Scott Bick demonstrated in his MS thesis that portions of the Mississippi Delta subside much slower than commonly believed. Given the fact that the land surface in many areas subsides at rapid rates (coastal Louisiana loses about one football field of land every 30-45 minutes), most of this is due to compaction of the highly unconsolidated Holocene cover. This type of information is essential to improve predictions of future sea-level change under greenhouse scenarios. 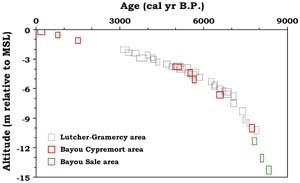 Our continued work on this topic by Shiyong Yu focused on the Louisiana Chenier Plain. These efforts also occur within the framework of a larger, collaborative project with the sea-level group at the University of Pennsylvania led by Ben Horton. Collectively we compile a quality-controlled database of postglacial sea-level data for the US Atlantic and Gulf Coasts that we ultimately hope to make available to the wider community. Glacial-interglacial scale climate and sea-level changes exert a strong control on the functioning of fluviodeltaic environments. We have studied these relationships for many years, with a particular focus on the northwest European Rhine-Meuse system. 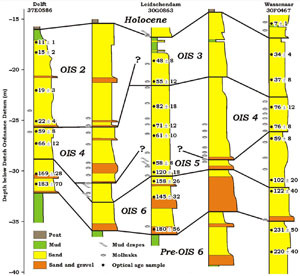 Our current efforts concern the late Quaternary evolution of the Lower Mississippi River, where we try to reconstruct how changes in climate, sea level, and crustal movements have modified longitudinal profiles, and, thus, stratigraphic architecture. Optically stimulated luminescence (OSL) dating plays a key role in these studies and this is the area of expertise of Zhixiong Shen, who works on this in close cooperation with the OSL lab at the University of Liverpool. Our field studies in the Lower Mississippi Valley are carried out in collaboration with Whitney Autin. Most recently, we have extended our OSL dating to late Holocene deposits, with a particular focus on crevasse-splay deposits. These can serve as analogs for the river diversions that are widely considered the only remaining hope to sustain wetland creation in the Mississippi Delta. What happens to sediment-dispersal systems during sea-level lowstands? When we started exploring this question we soon found ourselves opening a Pandora's Box. Our close interactions with solid-earth geophysicist Glenn Milne and his group at the University of Ottawa has given us access to calculated shoreline positions around the globe during the Last Glacial Maximum. We use these data to assess the relationship between lowstand shorelines and the shelf edge. An important ingredient of this work is the use of the the GeoWall virtual-reality stereo projection system, which allows us to take field trips to the continental shelf 21,000 years ago. The main finding so far is that passive margins show highly variable spatial relationships between lowstand shoreline and shelf edge, which has implications for source-to-sink sediment flux, sequence stratigraphy, and, perhaps of most interest, the fundamental question of how shelf edges actually form. Funding for the projects described here is or has been provided by the US National Science Foundation, the Petroleum Research Fund of the American Chemical Society, the United States Geological Survey, the US Department of Energy, the National Oceanic and Atmospheric Administration, the National Geographic Society, and the Coastal Restoration and Enhancement through Science and Technology program, along with the McWilliams Fund of Tulane's Department of Earth and Environmental Sciences, the Tulane Research Enhancement Fund, and Tulane's Oliver Fund.